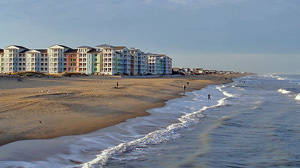 Sandbridge is where a lot of Virginia Beach vacation rentals are located. Sandbridge is kind of isolated from the rest of the resort area - which can be a good or bad thing, depending on what kind of beach vacation experience you're interested in. Things are a lot quieter out at Sandbridge and there are lots of houses available for rent that are located right on the beach. But the location means you'll have to drive if you want to do anything much other than go to the beach. There are a few restaurants and shops nearby, but most options are going to involve getting in the car. It's about a 15 - 20 minute drive to the resort strip. 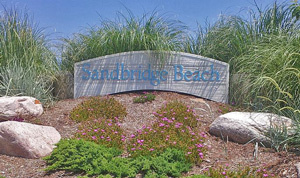 This site has a good overview of what's available in and around Sandbridge. All that said, Sandbridge is a very nice place to spend a beach vacation. There are five miles of beaches - and they're less crowded than the beaches at the resort strip. 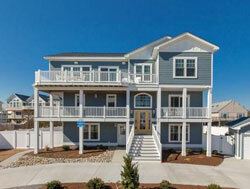 There are plenty of beach-front houses available for rent and many of the non-waterfront homes have water views. Hell's Point Golf Club is nearby, if you want to take in some golf while you're on vacation. And Back Bay National Wildlife Refuge is located just to the south of Sandbridge. 12 Bedroom Oceanfront Home - Large home with indoor and outdoor pools, elevator, game room, excercise room, theater room, large kitchen with two refridgerators, two stoves, and two dishwashers. Oceanfront property with ocean views from many rooms. Sleeps up to 40 people. Perfect for a large gathering. Three Bedroom Condominium - Three bedrooms, two baths, sleeps ten. Use of condo amenities, including pool, grills, and game room. 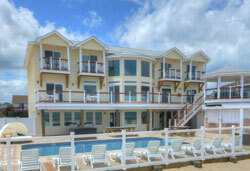 New 14 Bedroom Oceanfront Home - Large home fronting on the beach. Swimming pool and large deck. Roof top terrace. Indoor/outdoor poolside kitchen. 12 full and 2 half bathrooms. 14 bedrooms to sleep a total of 50 guest. Affordable 2B Sandbridge Condo - This condominium unit has two bedroom, plus a pull-out couch in the living room, to accomodate a total of 6 guests. Three tvs with DVD players, wireless internet. Two balconies with ocean views. Nine Bedroom Home with Pool - This large 9 bedroom, 8.5 bath homecan accomodate up to 26 guests. Swimming pool, hot tub, elevator, game room with pool table and poker table. 12 Bedroom Home with 2 Pools, Theater, Game Room, Elevator, and Direct Beach Access - This 9,600 square foot home is the place for a large gathering. With 12 bedrooms and 13 full bathrooms, there's room for 38 guests to enjoy a comforable stay. This beachfront home has two swimming pools (indoor and out), a large theater room, and a game room with pool table and arcade games. Large porches and decks overlook the ocean. 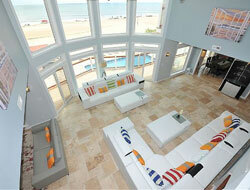 Beachfront Home with 6 Bedrooms & 4 Full Baths - This home is right on the beach, with magnificent views of the ocean. This 3 story, 4,326 square foot home has room to sleep 16.